FACT CHECK: Did Ronald Reagan Describe Nancy Pelosi as 'Extremely Evil'? Did Ronald Reagan Describe Nancy Pelosi as ‘Extremely Evil’? President Reagan may have termed the Soviet Union "evil," but Nancy Pelosi? President Ronald Reagan once said, “Nancy Pelosi is extremely evil” because she is a member of the politically connected D'Alesandro family. Displaying a flawed understanding of both the constitutional power granted to United States presidents as well as standard punctuation, the poster suggested “it’s time Trump exercises his right of reduction in force and get rid of this b****”, referring to Pelosi. The post, which included hashtags such as “#endtimes”, “#islam” and “#libtards”, was the earliest reference we’ve found to this alleged Reagan quote. The meme has since been shared by numerous other accounts that promote the QAnon conspiracy theory. Pelosi … noted [President Reagan’s] civility, a quality that has since all but vanished in Washington. “Ever a gentleman, he never questioned the motives of the person because he knew people in public office loved our country and acted on behalf of the American people,” Pelosi said. Her voice breaking, Nancy Reagan added, “It’s nice to be back under happier circumstances,” With that, the two women, both dressed in white, warmly embraced and turned to unveil the enormous bronze likeness. It is true that Nancy Pelosi hails from a powerful family of Baltimore Democrats. 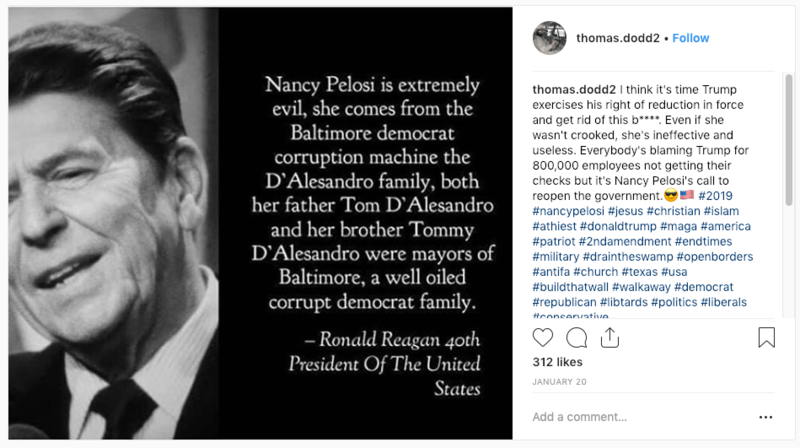 Her father, Thomas D’Alesandro Jr., “served 22 consecutive terms in public office, from state delegate to city councilman to U.S. congressman to Baltimore mayor, followed by a low-level appointment from President John F. Kennedy to something called the Federal Renegotiation Board.” Pelosi’s brother, Thomas D’Alesandro III, has also served as mayor of Baltimore. Because this quote only emerged 14 years after Reagan’s death as an unattributed, unsourced Instagram meme for “#libtards,” because we found no evidence to support the notion that Reagan ever said anything close to these words, and because the sentiment expressed does not sound like something Ronald Reagan would say, we rate this claim as false. 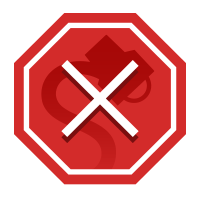 Update [30 January 2019]: Added comment from the Reagan Foundation. SF Gate. 4 June 2009. The Washington Post. 10 November 2006.